Preheat oven to 350 degrees. Coat 13x9 pan with cooking spray. Place chicken in saucepan and fill with enough water to just cover. Bring to boil. Reduce heat and simmer 10-15 minutes. Drain the chicken and cut into 1-inch pieces. Transfer chicken to large bowl and add beans, sour cream, 1 cup cheese, chilies, cumin and pepper; mix and set aside. Arrange enough tortillas in bottom of baking dish to cover it completely. 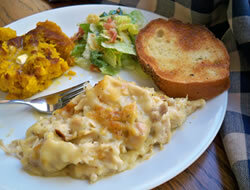 Top with one third of the chicken mixture, then repeat with two more layers (like lasagna). 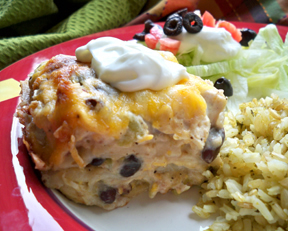 You should end up with three layers of tortillas and chicken mixture, with the chicken mixture on top. Bake until filling is bubbling and cheese is melted, about 30 minutes. Let stand for 5 minutes. 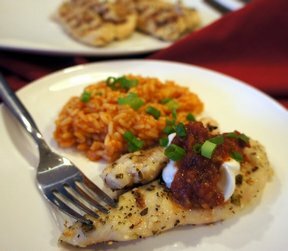 Serve with salsa on the side. (Chopped tomatoes and lettuce optional). 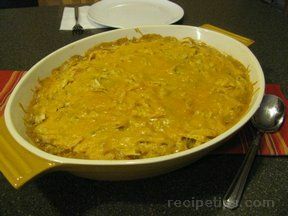 "We went to a Cinco De Mayo party on Saturday night at some friends and I made this casserole to take. Wow! Everyone loved it . . . was perfect for the occasion."